3in1 – ways of use – all prepress tools in one high quality package!!! – Your potential competitors can’t see your matrices in the service studio… Your customers and your secrets stay with you. The following three tabs describe the main areas of application. process version Conventional PS plates sensitive to UV light, providing the highest obtainable quality Inkjet CTP systems, and at the same time freeing you from a single vendor’s plates! Of course, we encourage you to use our approved plates, but you can also try any other supplier. 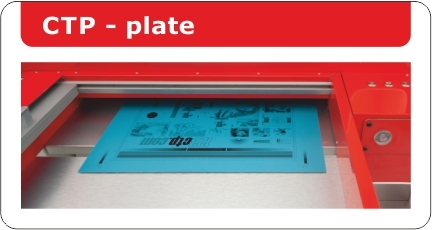 Suggested retail price for our approved plate 123platePRO is less than € 4.99 per m2 (excluding VAT) – this is much less than any other technology supplier of Inkjet CTPs. The conventional plate also facilitates the implementation of production at the printing press too. Starting with the fact that your pressman does not have to change anything from the standard applied chemistry on his printing press, and ending with the habits of the machine operator – ALL remains unchanged. processless version, (dry plate) which can be placed in an offset machine after imaging without developing (it is only fixed with heat) for make lower quantities of less demanding work in CMYK. The advantage of this solution is the minimum amount of work needed for the execution of the matrices and the lack of a wet section. Dry plate price starts from 12.95 € / m2 (excluding VAT). Schedule a test plate in the format of your press at your dealer – print in your printing house from the test 123plates and see for yourself what you can gain by using this universal system. Your new system is also a full-fledged replacement for imagesetters. 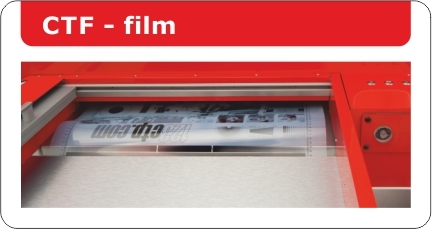 So, if you need classic films to use with other techniques such as screen printing, UV varnish finishing, pad printing or flexo, all the matrices you need can be done with the 123ctp system. Dedicated original Epson inks and a special film with a stable polyester base allow you to obtain great mapped details, smooth tonal gradients and fine details, all at a quality which until now was reserved for laser systems only. An additional advantage of the film produced on the 123ctp system, is its total processless production. These films do not need to be developed and are ready immediately after taking them out of your new machine! Unbelievable?! See for yourself and order the test matrices at your dealer! Aluminum plates and matrices (“films”) are not all you can do. At the beginning of the design process, we set ourselves the task of versatility. That’s why we didn’t destroy color printing abilities. This machine can print quality color digital proofs. 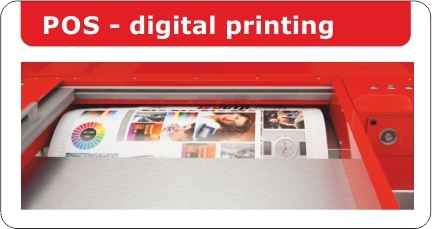 The machine has a roller supply with an automatic cutter, this set can become your new digital printing center in wide format and photo quality! Professional photographers can order enlargements, plus you can print on all coated media up to 1.5 mm thick, such as banners, adhesive films, backlite foils, canvas and various papers. If your client wants to order 10 A1-size posters, it’s no problem. You can offer him a cup of coffee and do it on the spot. A1-size printouts in full-colour speed mode take only 28 seconds!!! …Let us impress you! Ask your dealer for sample color prints.